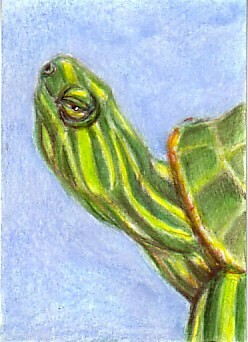 I needed to draw a turtle artist trading card for a trading partner last week. I looked through some pictures I had taken at the zoo and came up with this guy. I like the expression on this face. What a grumpagus, if that’s a word. If not I’ve just made it one. I’m planning more regular posts for August. I’ve finished a large stack of artist trading card requests and now I can get back to my daily drawing. I’ve noticed that my drawing has become so tight and careful lately. I want to try a few different things to get the fun back into my drawing practice. Hopefully they will pass muster for posting. Thanks for stopping by. I always love to read your comments. Glad you like him Michaela. I’d like to work on more turtle drawings. very beautiful, Mellanie! Love the turtle!